In fact my application to blogging is so bad it is surprising I actually manage to ride my bike on a regular basis! Since Tim and I rode the Heaphy track in May my world has been full of work, work and more work, with some riding and running slotted in. I have completed a few events including the Santoft Sizzler in Foxton where I struggled to 3rd place (so I wasn't as fit as I thought!). I have enjoyed a couple of cyclocross races (I see another bike on the horizon) as well as my first road criterium. I certainly see more of these short, all out efforts in my future. 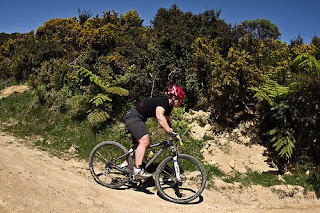 I also completed a Wellington Mountain Bike Orienteering Series with great success, somehow managing to win the series. This weekend was the beginning of a "Big November" (after all I have a wedding dress to fit in January and there is nothing like the extra motivation to get you moving). That was yesterday and what a great day out it was. The Revolve team were slick and the event was very good. My aim to ride consistently for 6 hours and try and make my first lap the same speed as my last lap. I have to say I failed with this. My first lap was really slow, somehow I managed to be talking when the race started and got held up big time, and so my last lap was about a minute faster than my first. After I settled into the day, I really enjoyed it. The climb wasn't long enough to really hurt, Magic Carpet was fun, and the descent was long enough to recover. Even though the course was short and lacking any technical challenge, it was not boring at all and the laps just disappeared and suddenly I had completed 14. I felt strong and really gave it my all. I ended up 3rd in what I think was quite a solo strong field and 4th overall. I would like to thank all the ladies who kindly pulled over and let my past so quickly and nicely, it really made my day! Sorry about the very load hub too! And, thanks for the photo Pete Marshall. I was pleased to get some good solid kilometres into my legs and topped it off with a quiet hill run today! So, what is all this leading up to? (not just my wedding) the http://kiwibrevet.blogspot.com/2011/11/2012-course.html. So, for at least the month of November there should be some blogging again!